Lately we have been seeing a lot of smart cameras coming from Samsung, well we have another one. 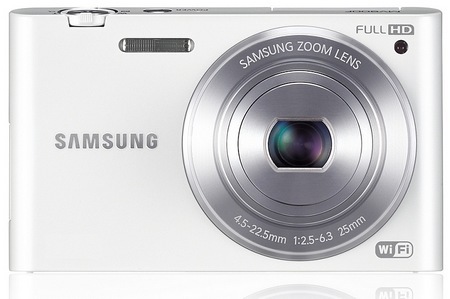 Samsung is now shipping the MV900F, the newest digital camera among the company’s Wi-Fi SMART camera offerings. Building on the popularity of its predecessor, Samsung’s MV800, the MV900F’s innovative 180-degree MultiView display makes it easy to capture creative self-portraits from any angle, and now with the addition of Wi-Fi connectivity – also easy to share images with friends and family. Priced at $349.99 (MSP) and available for purchase at retailers nationwide, the MV900F comes in sophisticated white and black. Integrating Wi-Fi technology into the MultiView line, the MV900F instantly connects with Facebook, Picasa, Photobucket and YouTube without the need for any wires or cables. With just the touch of the dedicated SMART LINK button, or through the intuitive touch screen, sharing and securely storing pictures is a breeze. Beyond social sharing, Samsung’s unique MobileLink app* helps users easily transfer and display images from an MV900F onto Samsung smartphones, tablets, or Smart TVs for a truly integrated ecosystem with painless sharing and synching across all devices. With the two latest smart cameras Samsung released, it’s pretty hard to choose between the two.